Liberals and Democrats have tried numerous methods to prevent people from voting Republican. They’ve tried calling Republican candidates for any office dumb, stupid, uneducated, an amiable dunce, a hick, a hayseed, ignorant, and the numerous other adjectives Roget’s Thesaurus offers for the term ‘dumb’. When liberals and Democrats proved unsuccessful in their attempts to convince a sufficient number of the subset that Republican candidates are dumb, they attempt to divide and conquer the voter by groups. They attempt to convince the voter that the Republican candidate is anti-woman, anti-minority, anti-science, anti-health care, and anti-legal immigrant. If that does not work, they declare the Electoral College antiquated. “This time it’s different,” Democrats and Democrat loyalists say in every election cycle. “This candidate is no (fill in the blank with a former Republican office holder). This candidate truly is dumb, incompetent, racist, anti-whatever.” This casual observer wonders why no one calls them out on this, for this is the very definition of talking points. I must concede that if it ever became ineffective, they would not do it anymore. With great frustration, many liberals and Democrats are forced to admit that many of their efforts have been in vain. In frustration, one liberal theorist stated that if it weren’t for the invention of air-conditioning we wouldn’t be in this mess. This mess was a description of having a Republican in office rather than an Algore. The liberal said this, because he was miffed that people in the Midwest, and in the South, continue the stubborn, mean-spirited tradition of voting Republican. If it weren’t for air-conditioning, the liberal furthered, no one would want to live in Kansas, Nebraska, Iowa, or the Dakotas. It would be unbearable to live in those states were it not for air-conditioning, and if they couldn’t live there those people would have to move here (California), and they would get swallowed up by the enlightened and sophisticated voters to such a degree that their votes wouldn’t count as much as they do in air-condition-ville. In this ever continuing saga of trying to get people to stop voting Republican, or at least take some of the weight away from those Cro-Magnons that do, the state of Massachusetts passed a law in July, 2011 that they hoped would set a precedent for the rest of the country to follow. This Massachusetts state law states that the winner of the national popular vote will receive the Massachusetts electoral votes after the fact. Now, no one cares about Massachusetts. Massachusetts has a mere eleven electoral votes, and the last time the state gave its Electoral votes to a Republican was the last time the other choice was Mondale. That’s right, they weren’t the state that voted for Mondale. That was Mondale’s home state of Minnesota, and he won that state by .18%. No, what Massachusetts was hoping to accomplish with their law was precedent. They were hoping to create a bandwagon that Nebraska, Kansas, Iowa and (cross your fingers) Ohio and Florida would follow. A president-elect losing the popular vote and attaining the office has happened a total of five times, as of 11/15/16, but liberals and Democrats don’t care about all that nonsense. They’re still smarting over their most recent loss in the presidential campaign, and they never want it to happen again. They want to further remove whatever minuscule power is currently afforded to Iowa, Kansas, and Nebraska and drown it in the power of the California, New York, Pennsylvania and other “sophisticated, enlightened” voters. “Presidential candidates now ‘ignore wide swaths of the country’ they consider strong blue or red states and focus their campaigning on contested states,” State Senator James B. Eldridge said. “If the president were picked by national popular vote, he argued, candidates would spread their attention out more evenly. “That’s really what we’re talking about is making sure that every voter, no matter where they live, that they’re being reached out to,” he said. Actually, the candidates may never leave California in the presidential election. Why would they? Unless it was go to New York, or maybe Pennsylvania, or maybe Texas. Long story short, the power to swing states, such as Ohio and Florida, would be forever countered by those with specified interests. The states listed above have a profound effect on an election, but my contention, based on my knowledge of how different the interests are in each state, is that the popular vote alone would not represent the geographic interests as well as a constitutionally-based, representative republic does. In the creation of a constitutionally-based Republic, one of The Founders, James Madison, had a theory regarding the creation of a representative republican form of government, as reported by Michael J. Klarman in his book The Framers’ Coup. In an effort to make joining this idea of a Representative Republic more attractive to smaller states, The Founders decided the best solution was to give them some representation in the government. They gave them equal representation in the Congress, by making representation equal in the Senate, and they decided to give them some voice in declaring who the president would be through the Electoral College. In their formulation plans, The Founders also had to ask themselves, “Why would Rhode Island or New Jersey want to join the union if their sovereignty was swallowed up by their more densely populated neighbors, and why would a futuristic Wyoming want to remain in the union if they did not have what they considered some measure of equal representation?” Wasn’t representation the theme of The Founders’ fight? Another theoretical they must have asked regarding the president is, would a Rhode Island, or a future Wyoming, recognize the comprehensive power of a president if they felt they had no say in that president’s election? Right now, Wyoming residents have the power of three electoral votes versus California’s fifty-five, so their power is minuscule by comparison, and some might say largely symbolic, but imagine their complaints if they didn’t even have a symbolic level of say in their representation, especially when that Representative Republic was formulated by people who fought against their lack of representation in Britain. Why would a Wyoming, a Rhode Island, or a New Jersey want to give up all semblance of sovereignty to join a union in which they don’t even have a minuscule amount of representation. If it’s taken away, why would they want to stay? States that continue the stubborn habit of voting in an “uneducated, mean spirited” manner (see Republican) would no longer count as much in a popular vote in which every vote counted. Iowa could still have its one day (I guess), in the primary, but other than that the entire Midwest wouldn’t count anymore. (Can I get a HAZZAH!) These states have VERY LITTLE power now, but with this new Massachusetts law, the larger states could wave good riddance to them for once and for all. Whenever a Democrat wins the popular vote and loses the electoral college, liberals take to the proverbial streets to proclaim the electoral college antiquated. If the tables were reversed, and Republicans were winning the popular vote and losing the electoral, something tells me the roles in this discussion would be flipped. As many before me have said before, America was not founded as a democracy. It is a representative republic. As such, the only pure population based representation this Constitutional Republic offers is located in the House of Representatives. The representation in the Senate is not population based, the representation in the Supreme Court is not population based, and neither is the executive branch. If we were to do away with, or diminish, the comprehensive power accorded to smaller states in the electoral college of a presidential race, would we then have to revamp the Senate, and the Supreme Court, and our entire system of governing? For those decrying the unfairness of the Electoral College in a presidential race, there are just as many on the other side decrying that one un-elected “swing” judge, on the Supreme Court, who decides to vote on a case before him that decides the fate of 320 million people. If we addressed the concerns of those that deem the Electoral College antiquated, would we then have to decide the “fairness” of having nine un-elected judges on the Supreme Court? Would it be more fair to have fifty-one Supreme court jurists, each appointed, or elected, to their seats by the fifty states, including Washington D.C.? Before those espousing this “fairness” doctrine, under the equal protection clause, agree that this is only fair, go ahead and take a look at the 2016 presidential election map. By my count, that would equate to at least twenty-nine Republican jurists. As Madison declared, the basics of a representative republic are such that geographical concerns take precedent. The concerns of the rancher in Wyoming are given some representation in this form of government. The ranchers are not given as much representation as the orchard owners in California, or the Wall Street employees in New York, but in a population-based, pure democracy, the rancher would have little-to-no voice in the government. Furthermore, in a popular vote world, no presidential candidate would visit the Midwest. The reason a Constitutional Republic is the preferred method of government, according to Aristotle, and I paraphrase, is that people will vote their own selfish concerns, as all politics is local. To quote Benjamin Franklin, on this note, “When the people find that they can vote themselves money that will herald the end of the republic.” My interpretation of these two quotes is that the electoral college of the Constitutional Republic keeps the interests of various groups throughout the country varied enough that no one group’s interests become a primary concern of the governing. Or, at the very least, the minority interests have some say. I read of an interesting analogy. The World Series. The winner of the World Series is not determined by the total number of runs in a given series, it is determined by the team that wins the most games in a seven game series. In the same vein, the presidential election is basically fifty-one different elections (including the District of Columbia). The liberals say that the Electoral College was developed because the Founding Fathers believed the masses were too stupid to vote in an educated manner. This is not true, but if it were then we must ask if they want to dissolve the institution of the Electoral College to take away power from the uneducated voters (or anyone not in New York or California, or anyone that doesn’t vote for Democrats en masse), or to give more power to the uneducated voter. As I said, it’s not true that the Electoral College was developed because the Founding Fathers believed the masses were too stupid to vote in an educated manner. It was developed as an effort to help thwart the idea of a direct democracy. The founding fathers saw direct democracy as a possible evil that could lead to demagoguery, susceptibility to bribery, and possible poisonous political patronage. The Founding Fathers also wanted to give power to the states. In other words, the Founding Fathers wanted to give some power to the minority to prevent the tyrannical rule of the majority. The Founding Fathers were so against putting any prominence on the popular vote that the popular vote wasn’t even counted until the 1824 election, the first election in our nation’s history that didn’t include a Founding Father. Guess what happened? That’s right. Controversy. The eventual winner, John Quincy Adams, did not win the popular vote. In this particular election, however, no candidate won a plurality of the Electoral votes either, and the House of Representatives was forced to decide the president, a precedent that would never occur again after the 12th Amendment was passed. Liberal Democrats have claimed to be supporting “the little guy”, for as long as I’ve been paying attention. They claim to support the minority, but these claims are limited to the voting groups that favor them. If they were truly for the minority, in the sense that the Constitution was set up to protect the minority from the tyranny of the majority, they would favor the Electoral College, until it revealed itself as not favoring them. The Democrats make the claim to be anti-corporate, even though it could be argued that “Big Corporate” America flourishes during Democrat administrations that provide the country regulations that large corporations can afford to comply with and small mom and pop companies fold under, and they claim to be anti-rich guy, even though it could be argued that the divide between rich and poor exacerbates during Democrat administrations. Yet, this idea that the Electoral College was set up to protect the minority from majority rule is deemed unfair when their candidate doesn’t benefit from it. As I argued against the majority of people that believe the Electoral System is antiquated, I wondered what my own feelings would be if my guy won the popular vote and lost the electoral vote. Would I be just as hypocritical as I believe they are, if the roles were reversed, or would I remain steadfast in my belief that the Founding Fathers attempted to set up a system that did not sway to modern desires and wants, until those wants and desires proved so great that the difficult amendment process, or a state by state process like the one developed by Massachusetts, could be implemented to correct it? Or, would I be so emotionally distraught by the election results that I would say Constitution be damned, I want my guy in, and I think this whole idea of a constitutional government is antiquated? I would like to think that my knowledge of the Constitution, the theories behind it, and the idea that America has flourished under the comprehensive ideas inherent in the Representative Republic would sway me to accept it as is, as opposed to the way I want it to be. The bill preserves the Electoral College, while assuring that every vote is equal and that every voter will matter in every state in every presidential election. 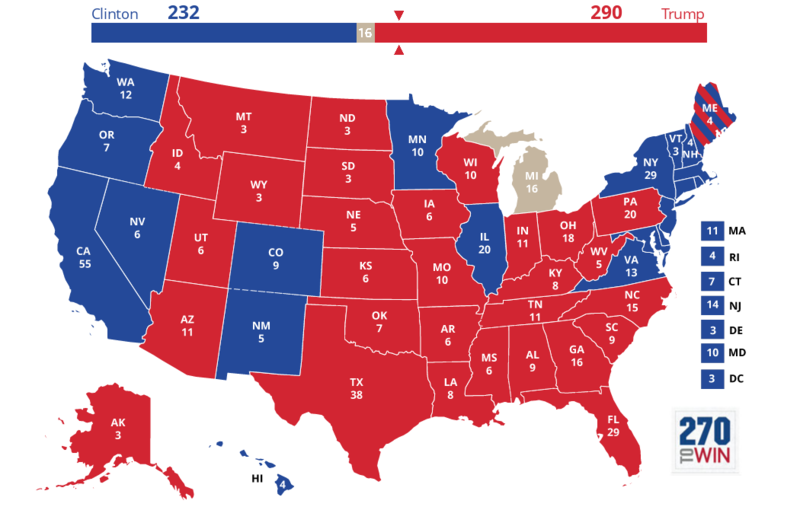 The Electoral College that we have today was not designed, anticipated, or favored by the Founding Fathers but, instead, is the product of decades of evolutionary change precipitated by the emergence of political parties and enactment by 48 states of winner-take-all laws, not mentioned, much less endorsed, in the Constitution. The bill uses the power given to each state by the Founding Fathers in the Constitution to change how they award their electoral votes for president. It does not abolish the Electoral College. Historically, virtually all of the major changes in the method of electing the President, including ending the requirement that only men who owned substantial property could vote and 48 current state-by-state winner-take-all laws, have come about by state legislative action. 1,922 state legislators (in 50 states) have sponsored and/or cast recorded votes in favor of the bill. In Gallup polls since 1944, only about 20% of the public has supported the current system of awarding all of a state’s electoral votes to the presidential candidate who receives the most votes in each separate state (with about 70% opposed and about 10% undecided). Support for a national popular vote is strong in virtually every state, partisan, and demographic group surveyed in recent polls in closely divided battleground states: CO– 68%, IA –75%, MI– 73%, MO– 70%, NH– 69%, NV– 72%, NM– 76%, NC– 74%, OH– 70%, PA — 78%, VA — 74%, and WI — 71%; in smaller states (3 to 5 electoral votes): AK – 70%, DC – 76%, DE –75%, ME — 77%, NE — 74%, NH –69%, NV — 72%, NM — 76%, RI — 74%, VT — 75%, and WY – 69%; in Southern and border states: AR –80%, KY — 80%, MS –77%, MO — 70%, NC — 74%, and VA — 74%; and in other states polled: CA — 70%, CT — 74% , MA — 73%, MN – 75%, NY — 79%, WA — 77%, and WV- 81%.